This is part one of a two-part piece, where Oke discusses his trip to Oregon to mine gems. Part two will follow. I like rocks. Specifically, I like gemstones that I can make into jewellery. It’s a business of mine. 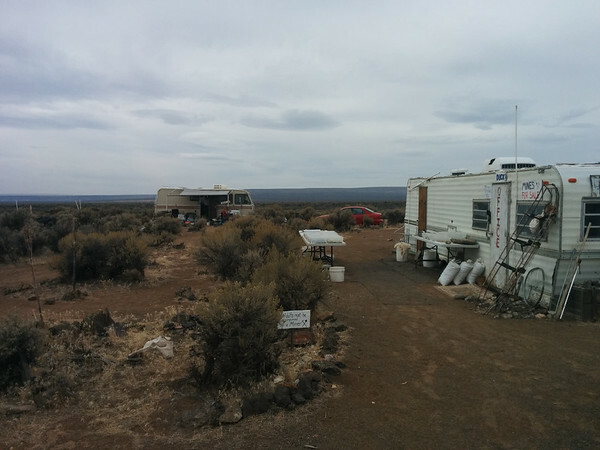 And recently, when I was in Oregon in order to attend a gemstone faceting course (more on this later) I decided to add a little extra time so I could go fossicking for Sunstones in South-Central Oregon. Oregon Sunstone is a plagioclase feldspar, which is also Oregon’s state gemstone. While similar gem feldspars are found elsewhere, only the material from the Plush region exhibits the unusual ‘schiller’ copper inclusions and the brilliant red/green/teal colours. Clear to yellow sunstone is not particularly valuable ($20 a carat is a good starting point – although apparently on the TV, they’re selling clear sunstones at $100 a carat) but top end coloured sunstone can fetch $1000 a carat – or more – and it was this material that I was going to pursue. The best source of Oregon Sunstone is in the Hart Mountain range, near a small town (very small town) called Plush, Oregon. Getting to the Sunstone digging area is good fun – you take highway 140 out to Plush, and from there you do the last 25 miles on a reasonably well-maintained unpaved road. I was in a rental Honda Civic (thank you, Hertz) and had no issues, but I would strongly suggest you check your spare tire, and make sure you top off your tank before leaving Plush. Going up to the mines, there are ZERO services. Nada. Zip. Bupkis. Nary a 7-11 or convenience store. You’re heading to the Oregon version of the Australian Outback, so be a good Boy Scout and be prepared. 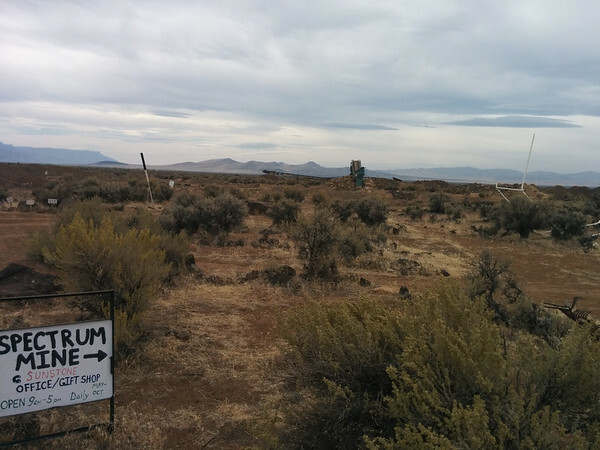 – You can dig for free in a small public area managed by the Bureau of Lands Management. Most of this material is likely to be on the low-end (clear) maybe you would get lucky and find some with a bit of schiller. 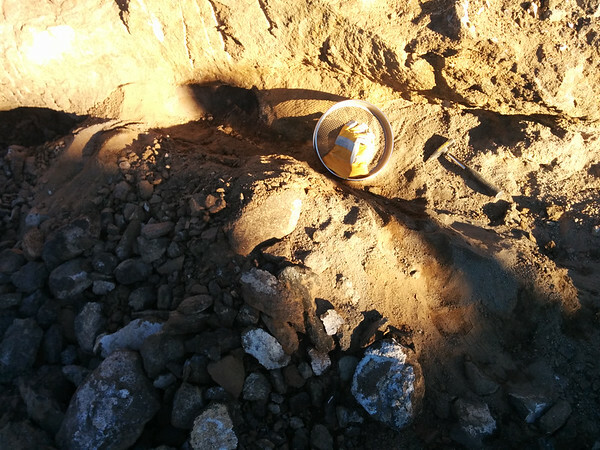 – The entire sunstone area is mostly ‘claimed’ off – so just parking on the side of the road and going to have a bit of a dig is not recommended, as you will likely be digging on someone’s claim. And out here in the desert, most people are prepared to fend for themselves, rather than call for the police. o Dust Devil Mine: Perhaps the largest operation, they charge the lowest dig fee of the three operations, but will ‘high-grade’ your finds and make you pay a fee to keep anything ‘premium’ quality you find. I didn’t care for this idea – if I dig for something, I want to keep it. o Double Eagle Mine: I don’t know much about this place – they seem to operate a reasonably priced option, and you can keep what you find. o Spectrum Mine: My choice – several fee options, and no question about your ability to keep what you find. Note – Spectrum, Dust Devil and Double Eagle all have websites, and if you’re planning a trip, I suggest you check out the sites, book ahead, and be familiar with everything before you leave. These are all operating commercial mines, so hours of operation are pretty consistent – however their readiness to receive guests, manage campers etc… may vary, so do them a favour and book ahead. Having chosen to visit Spectrum, I made the trip out to the mine, planning to stay two nights. I planned ahead and brought a sleeping bag, some beverages, and some food. Spectrum has three simple cabins available for you to use – these are simply wooden structures that replace the need to have a tent/RV. Unfurnished, no electricity, no wi-fi (indeed, no mobile connectivity in the area at all). You are clearly, roughing it. So – if you’re looking for a plush hotel, this is not the trip for you. The mine does have 2 flushing toilets, and two solar-heated showers. You should arrive at Spectrum with everything you need to be self-sufficient for your entire stay, and be prepared to face the consequences if you forget something. The closest convenience store is back in Plush down that 25 mile stretch of dirt road. The closest largish store (like a Safeway) is about 100 miles away in the town of Lakeview. Arriving at Spectrum, I was greeted very warmly by the mining staff. The miners are surprisingly all quite young (i.e., university grads, early 30’s etc…) and are very personable and knowledgeable about local geology, the local flora and fauna, and of course, about how to dig for sunstone. – A ‘Belt Run’ – where they take a load of ore, run it through a trommel (in order to filter out anything oversized or particularly small) and then sift the processed ore onto a belt with water. You simply stand at the belt for an hour, and madly pick off your sunstones as they pass by. Think of the ‘I Love Lucy’ chocolate-making scene. In dusty heat. One hour at the belt will mean you’ll process about 5 tons of material – compressing many hours/days of hard work into one hour at the belt. If you are short on time and just want to get some sunstones – then the belt run is your best choice. They charge $200 for an hour. – Digging in the actual pits. Various fees, based on the miner’s assessment of how good the potential ore is in any given area. Some sections of the mine are free to go in and dig, some sections $100 a day, some $200 a day, and some are simply ‘off limits’ as the ore is processed commercially. Pit area before digging started. In the end, I chose to do six belt runs (buy five and get one free), and then extra pit digging. I was there with a friend, so we decided to go 50/50 on everything we found, and decided on a fair way to divide up the ‘premium’ stones that we found. The results? My share after the belt runs was nearly three kg of clear – light ‘schiller’ sunstone off the belt runs. I intend to grade this over time, and select about one kg of the best material which I will send off to Thailand for commercial cutting. This should return to me over 1000 carats of cut clear/yellow sunstone (20-25% return of cut stones from rough is an industry guideline, and a carat is simply 0.2 of a gram). In addition, I got half a dozen large (20 cts+) red sunstones, which I will cut personally. These should cut multi-carat vivid red sunstones, which should be quite valuable pieces, barring cutting problems. I also got about 250 grams of intense ‘schiller’ stones which I will either facet, or cut ‘en cabochon’. From our digging in the pits, we retrieved fewer large stones, but a better ratio of coloured/schiller material to clears. For $500 each, and the fuel to get out here, we were both very pleased with our return on investment from all perspectives: cash outlay, time spent, and effort. In summary – the ‘belt runs’ will get you a large volume of material, but that will be mostly clear. We also got a couple of ‘premium’ stones from the belt runs, larger and better colour than anything else we got in our trip. The belt run was a good value for money. Digging in the pits was hard work, although enjoyable and a really good workout. Spending a couple of weeks at Spectrum digging in the pits, would be a great weight-loss/fitness regimen, and would also pay off financially! We retrieved much more ‘useful’ material in pit digging, although smaller sized stones. If your goal is to get stones with colour and/or schiller – and you really don’t want/need any clear stones, then you’re better off to go digging and hope to get lucky. Part two: Helpful hints for mining!